Dae Myung Optical Openen New Official Website (www.dmo.co.kr). DAEJEON, KOREA--(Korea Newswire) December 16, 2016 -- Daemyung Optical(DMO)(www.dmo.co.kr) has reformed its website to enforce communications with clients both domestically and internationally with its 31st year anniversary . The new webpages after the reformation are characterized as simplifying the product introduction, company introduction, major capabilities, news and contacts for easy understanding and approach with its new menu and contents. In addition to this, a further feature to see new functions for new designs is introduced. In order to be able to promptly provide beneficial information for clients in collaboration with optical shops, the new designs are now approachable using computers, smartphones, smart pads, etc. according to their layouts and faster executions which allows you a friendly and efficient usage. Aside from these, considering the client convenience, total 6 web browsers including Chrome, Mozilla, Safari, FireFox, Netscape, not to mention Internet Explorer are supported so both old and young generations can easily obtain relevant information from the website. 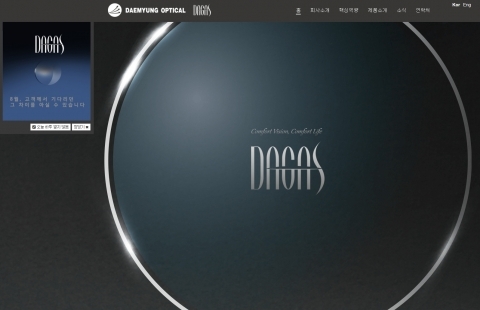 The webpage's design which introduced the identity of the brand of Dagas is also one of the greatest features that represent the webpage. DMO’s unique color of black and blue, along with white are used to deliver the image of confident service of trust, high class and worthiness and through the simple layout, it also provides the consistency of visual communications. DMO, as part of online marketing promotions, enforced a viral marketing using websites including YouTube and various SNS services to reach clients more friendly and introduce their products further by continuous improvement and development to lead the Korean Wave as a global ophthalmic lens company. Give HUREN to your family for a Christmas gift!